A smartphone app that I find quite useful is Shortwave Broadcast Schedules by Chris Smolinski at Black Cat Systems. Chris has just announced an update which adds features like the ability to enable schedule reminders as well as keep track of your favorite broadcasts. I’ve been using this app for a year and have noticed frequent schedule updates–indeed, A14 schedules were ready at the beginning of the season. It’s an ideal app to use for one bag travel–indeed, you don’t even need an Internet connection to browse the listings. Admittedly, the typical smartphone screen is fairly small to display such a large amount of broadcast data, but Back Cat’s interface is designed with this in mind. I find the app easy to use and very useful while I’m on the go. I have only used the iOS version on my iPhone. Black Cat also offers an iPad version which, I believe, would be ideal. I have not tested the Android version of the app. 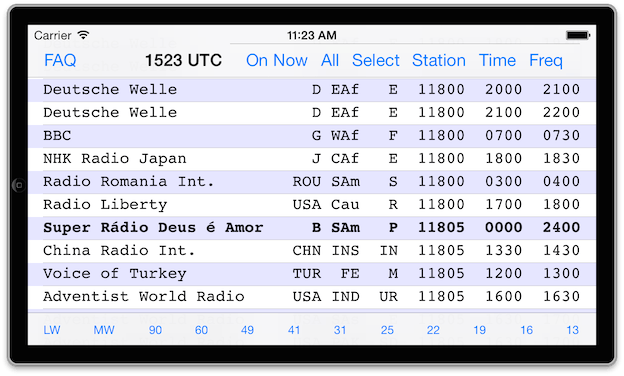 Shortwave Broadcast Schedules is available on the iPhone/iPad ($2.99) and Android ($0.99) devices. Click here to check out our comprehensive, frequently updated list of radio apps. This entry was posted in Apps, News, Reviews, Schedules, Schedules and Frequencies, Shortwave Radio and tagged Android, Black Cat Systems, Chris Smolinski, Ham Radio Apps, iOs, Shortwave Apps, Shortwave Broadcast Schedules, Shortwave Radio Apps on April 10, 2014 by Thomas. Also http://www.shortwave.am for schedules updated automatically from changes from Eibi and AOKI combined. Maps are also display showing beam directions using Google Maps. http://short-wave.info works just fine on iOS browsers (iPad and iPhone). It’s my go to. I can drag the location indicator to my QTH and then sort by its best guess of signal strengths for stations I can pick up. It’s great and can always find something to pick out of the air. Yes! Short-wave.info is very useful. I especially like the fact that you can look up broadcasts by time. Gives me a way to check for broadcasts before they sign on. Many other online broadcast listings lack the ability to _easily_ sort by time. The one advantage of the app is that it will work without an Internet connection. If I’m traveling to an area without Internet, I simply have the app check for any schedule updates in advance, then I’ll have the entire updated schedule while not connected in travel.